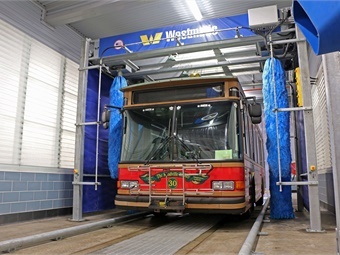 As technology continues to evolve, transit agencies are looking for more and more automation from their wash systems for numerous reasons. “What we are seeing [in transit] is a demand for heavy-duty wash systems that require little, if any, maintenance,” adds Jeff Ross, president, Ross and White Co.
Another trend suppliers are seeing is a move toward different brush technology, explains Jack Jackson, owner/president of Awash Systems Corp.
Jackson adds that another concern is water usage, especially as more and more agencies continue to make moves toward becoming more sustainable. METRO takes a look at some of the latest wash systems on the market today. Awash’s (Ecowash) efficient bus wash system uses less water, energy, and soap than any other machine or method of washing in the industry. 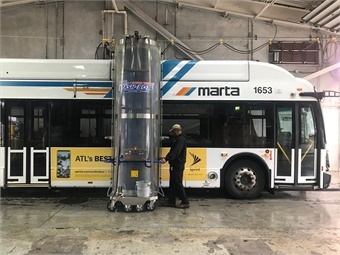 Available in any size, the only metered soap system available enables users to wash a bus in less than five minutes with only an ounce of soap and about 25 gallons of water per cycle. Bitimec’s Wash-Bots range from the affordable fixed-bay 101-BB electric to the top-of-the-line battery-powered Portable 626-EZ. 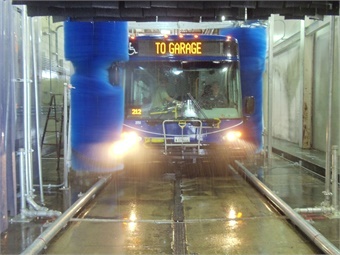 Both models allow “one” operator to do exterior bus-washing as fast as a five-to-six-person-strong wash crew. The operator simply walks the power systems around the vehicle, as “they” apply soap, power-brush, and rinse, with a touch of a button. The small footprint systems do not need a dedicated building and can be tucked out of the way when not in use. 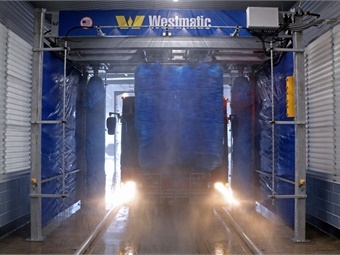 The washing and water recycling systems InterClean designs, builds, and commissions are based on decades of experience and include a drive-through Hybrid Wash System that combines friction and touchless cleaning. The XJ Wash System uses friction cleaning on the top, sides, and back with some touchless cleaning for sensitive (bike racks and mirrors) parts of the bus. The company also offers the newly redesigned Ultra Gantry System that can be configured for touchless-only, friction-only, or a combination of both cleaning technologies. All of the wash systems are available with InterClean’s EQ 100 water-recycling system, adding to the sustainability of its product line. 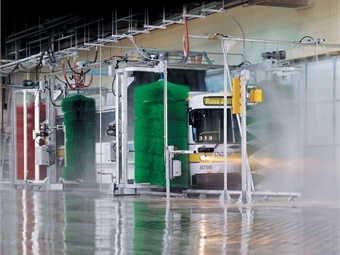 The 4X4-HPF-OM sets the transit standard for a high-volume drive-through transit bus wash. 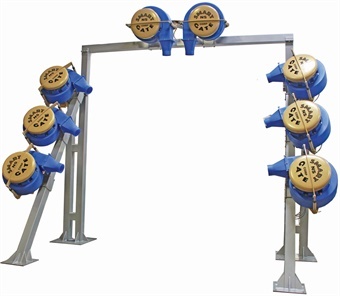 The system consists of a four-column, four-brush, wraparound bus wash, with oscillating overhead mop, high-pressure front, lower body, and wheel sprays. An upgrade to your blower system, the Smart Gate is a pneumatically-operated gate that opens and closes the inflow of air into the impeller chamber, reducing the power required to operate. When no vehicle is in service, the gate will close, eliminating frequent start-ups that drain the life of the motors. Most motors have a limit of approximately eight starts per hour; with the Smart Gates, you can keep the motors on while saving power. Minimize the unnecessary and onerous starts and stops, while reducing power usage. The Smart Gate attaches to most blowers; works with small compressors; reduces power consumption on idle by half; reduces starting power spikes; prolongs motor life; and reduces noise pollution. 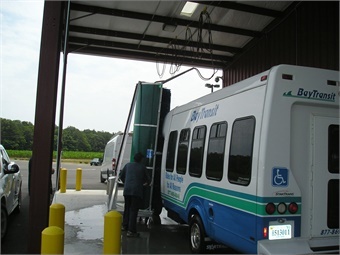 The versatile Transit-Master Brush Drive-Through Wash System is compact in size and features either four or six electronically-controlled brushes fully capable of washing the front, sides, and rear of the vehicle. Advanced engineering and full-density brushes provide a superior wash result while protecting mirrors and surface graphics. Its industry-exclusive overlapping brush movement eliminates any striping on the front and rear of the bus. Ideal for public transit buses or trolleys with front-mounted bicycle racks.